High Point University has a variety of community events meant to honor and engage individuals in the city of High Point and surrounding areas. The events are detailed below. If you or your company would like to know more about how they can become involved in these events, please contact Darren Hill, Director of Corporate and Community Support at 336-841-9555 or dhill1@highpoint.edu. Cottrell Hall Amphitheatre, April 25, 2019 from 4-5 p.m.
HPU is committed to preserving our environmental surroundings and sharing our appreciation for nature. 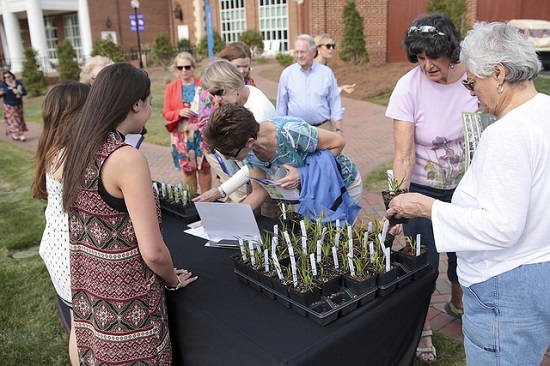 Each year, High Point University hosts an Arbor Day celebration on campus allowing members of our campus and community to engage in environmental stewardship and to celebrate with those who assist in enhancing our twenty-two campus gardens. The annual Arbor Day event will feature various speakers including HPU First Lady Mariana Qubein, who has spearheaded the transformation of the campus Arboretum and Botanical Gardens. High Point University will also recognize their Tree Campus USA status, one of only twelve universities to achieve such status. Tree Campus USA recognizes college campuses for promoting healthy urban forest management and engaging in environmental stewardship. High Point University is proud to say that we are a God, family, and country school. The University flies dozens of American flags across campus and we cherish the principles on which our nation was founded. To show our appreciation for the men and women who have served our country, HPU hosts an annual Veteran’s Day celebration. Last year, we hosted 1,200 Veterans and their families for a complimentary breakfast and great lineup of guest speakers. The community heard from High Point University President Dr. Nido Qubein, Ryan Manion, President of the Travis Manion Foundation, and special patriotic music from Nashville recording artist Stephanie Quayle. Millis Center, December 6, 2019 at 8 a.m. The High Point University Annual Community Prayer Breakfast is an event that sharpens the spiritual senses that joy and peace might take root during the Christmas season. For 48 consecutive years, HPU has hosted the Prayer Breakfast, bringing the greater High Point faith community together. The event includes a buffet breakfast, special Christmas music from the HPU Chapel Choir directed by Dr. Elizabeth Doebler and a message from an inspiring speaker. For two evenings in December, High Point University’s campus transforms into a Winter Wonderland. The High Point University Community Christmas Celebration has grown into the premier complimentary Christmas celebration in the Piedmont Triad. HPU’s Community Christmas is free and open to all ages, attracting over 20,000 to the University. The event includes Santa’s Stable Petting Zoo, Polar Express Train Rides, Life-size Nativity Scene, of course Santa, and much much more. For highlights of last year’s event, please click on the link here.